We offer wine stored in two different warehouses. Each lot lists the location of the wine so you know where it is currently stored. We will automatically arrange the logistics to import or export your wine depending on your location as part of our shipping process. Set your default search filter and only see the locations you want. We have brick and mortar retail locations in Newport Beach and Tustin, California. We offer an array of full service fulfillment options for your purchases with us. Below are some of our frequently asked questions. If we didn't answer your question, please contact us and we'll be happy to help. If you are shipping to the District of Columbia, New Mexico, Idaho, or Alaska, your shipment will default to standard ground shipping via United Parcel Service (UPS). If you are shipping within California, your shipment will default to Golden State Overnight (GSO). If you are shipping to any other US state, your shipment will be scheduled by default through a carrier such as UPS or FedEx. If you would like to adjust your shipping preference, method, or rapidity, you may always adjust your default preferences in your account page or you may of course contact us directly. We would like to advise clients that Golden State Overnight (GSO) typically delivers your shipment within one business day; however, this is not a guarantee and delivery may occasionally take longer than the overnight period advertised by this vendor, particularly for residential (non-commercial) addresses. 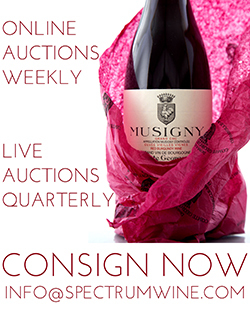 Such an eventuality is out of the control of Spectrum Wine Auctions. How quickly should I expect my order to ship? We own and manage our very own state-of-the-art temperature- and humidity-controlled warehouse and employ a full-time team of warehouse staff to get your order to you as quickly and safely as possible. Typically orders are available immediately after payment is received. Upon receiving payment our staff will automatically schedule your order to ship at the first available time slot. You will receive an email notification shortly after your order is paid with a shipment date. If weather conditions do not permit safe shipping, your order will be held at our warehouse (free of charge) until conditions become safe again. If you have a specific ship time you would like your order to depart, please give us at least 24 hours’ notice so we can prepare your shipment. Yes, we love to meet our clients and local pickup is a great option if you are in southern California. If you do plan to pick up your order please give us at least 24 hours’ notice so we can have everything ready for you when you arrive. We also have a great retail shop that you are welcome to peruse while you’re here. Our retail inventory can potentially be split between multiple stores. If you order online, we will consolidate and ship, but if you plan to walk-in, it is important to give us notice so we can make sure the wine you want is at the store you plan to go to. During periods of excessively hot or cold weather, we will store your wine in our temperature- and humidity-controlled warehouse free of charge. Once conditions improve we will begin to schedule your shipment(s) for delivery and you will be notified of its shipment date. If you would still like to ship your order regardless of temperature, we will be happy to arrange this but we will require you to sign a waiver stating you understand the risks of shipping during the current weather conditions. Can I consolidate multiple orders to help reduce shipping costs? Yes, we automatically consolidate all the orders you have with us and adjust the shipping expenses accordingly to give you the best price possible. The shipping cost you see on your invoice takes this into account automatically after each new order. Do you offer consolidated shipping options? *We also offer complimentary, refrigerated consolidated shipments to numerous storage facilities in Los Angeles, San Diego, and Santa Barbara. See list below. Yes, we offer refrigerated local delivery to the Greater Los Angeles and San Diego regions via our refrigerated delivery truck. We can accommodate small deliveries as well as larger deliveries of multiple pallets. $25 per delivery or $200 per pallet. 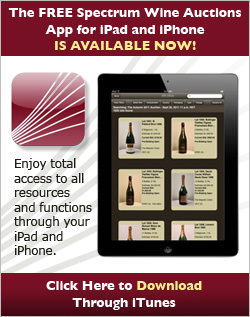 Do you delver to professional wine storage facilities? Yes, we offer complimentary refrigerated local delivery to many professional wine storage facilities in the Greater Los Angeles and San Diego regions. Below is a list of facilities we are currently delivering to on a routine basis. We are happy to add your facility as well, just give us a call or email so we can connect with the owners of the facility to set up a route. And if your wine storage facility is not on this list just give us a call! To which US states can you NOT ship wine? Many US states impose various, oppressive restrictions and costs upon outside firms shipping wine within their borders. For some states, Spectrum Wine Auctions often can, however, utilize external services that hold the relevant licenses to legally ship wine into such states. Does someone need to be available to sign for my packages? Yes, someone over the age of 21 years old must be present and able to sign for the delivery in order for the carrier to deliver your order.